Abdel Fattah el-Sisi, the former Egyptian army chief, got a sweeping victory in the country’s presidential election. Sisi won 96.2 percent of about 21 million votes cast, state television reported, with the ballots from 312 of 352 counting stations tallied. Hamdeen Sabahi, the only other candidate, received 3.8 percent of the votes counted. Voter turnout was low, at 44.4 percent, despite the government declaring the second day of voting a national holiday, and extending the election for a third day. US-based Democracy International, and election observer, said the extension “raises more questions about the independence of the election commission, the impartiality of the government, and the integrity of Egypt’s electoral process”. Sabahi said the extension aimed to “distort” the will of the people. His campaign pulled its representatives from polling stations in protest against what it called a campaign of intimidation and arrests of its campaign workers. 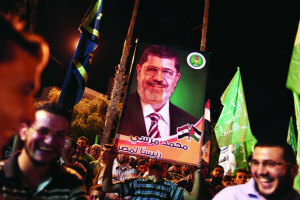 The Brotherhood, which called for a boycott of the election, hailed the low turnout. “The great Egyptian people have … written the death certificate of the military coup,” said its political arm, the Freedom and Justice Party. Sisi’s victory in the presidential vote places Egypt’s presidency back in the hands of a top military official just three years after Egyptians rose up against former dictator, Hosni Mubarak, an air force officer who ruled Egypt for nearly three decades. Official results of the vote are not expected to be released until June 5. Abdul Fattah al-Sisi, along with the interim government, the official media and Egypt’s powerful army have been acting for months as though this election was a formality with victory for him inevitable. They may have overdone it to an extent which has alienated some Egyptians – and left even those who like Mr Sisi not seeing much point in voting. At many polling stations soldiers on security duty have outnumbered voters and others have seen no voters at all for hours. Extending voting into a third day looked a little desperate – but it’s tantamount to an official admission that turnout has been worryingly low for the authorities. A win for Mr Sisi on a very low turnout would damage his authority as he takes office…..It would be particularly embarrassing for him to secure fewer than 13 million votes. That was the number recorded by Mohammed Morsi the elected Islamist President whose removal from office was led by Mr Sisi last year when he was still serving in the army. For those who supported military coup in Egypt and brought a swift end to the country’s revolutionary moment, the upcoming coronation of Abdel Fattah al-Sisi will be their crowning achievement. Even more troubling than the deafening cheers in favor of Sisi’s ascension has been the tendency by many observers to confer upon presidential elections in Egypt an air of legitimacy they have neither earned nor deserved. The painstaking coverage of campaign rallies, televised interviews with candidates, and electoral programs notwithstanding, there is nothing that would suggest that the election occurred in the climate of relative political openness and freedom of choice for millions of Egyptians that marked those earlier elections. The claim made by Sisi’s supporters and parroted by world leaders that the military’s intervention signalled another milestone along the revolutionary path stands in stark contrast to the climate of fear perpetuated with clear intentionality on the part of the old regime to restore its unassailable status. In the first major test to its supposed democratic inclinations, in January the interim government arrested activists who advocated a “no” vote on the referendum to approve a new constitution crafted in large part by the military. More than such direct measures, however, Egypt’s security forces have succeeded in constructing a repressive climate marked by fear and paranoia, ensuring that political choices expressed by people at this time are hardly reflective of their genuine preferences. The hundreds of people killed by security forces on Egypt’s streets since last July were joined in recent weeks by hundreds more whose execution was determined by judicial order. In less than a year, a reported 23,000 people have been imprisoned under the most spurious political charges. Most have been denied their due process rights and reports of torture and sexual assault in custody have become widespread. Though Sisi emerged winner in the election. But one has to wait and see if he would manage to serve out his term. Born in Cairo in 1954, Sisi spent many years in military training and served as a military attache in Saudi Arabia during the era of President Hosni Mubarak. After the 2011 revolution that ousted Mubarak, Sisi took charge of Egypt’s military intelligence, and later presided over the 2013 coup d’etat that removed Muslim Brotherhood leader Mohamed Morsi from power. Speculation about Sisi’s plans to run in the 2014 election emerged swiftly afterwards, but it was not until late March that he officially “gave up the uniform” in exchange for a presidential bid. For months, Sisi has played on the citizenry’s fears, trumpeting the country’s crackdown on the Muslim Brotherhood as a way to restore stability. On December 25, Egypt’s interim government declared the Muslim Brotherhood a terrorist organisation, and more than 500 of the group’s supporters have since been sentenced to death. Under Sisi, mass trials in Egypt have drawn widespread condemnation. Hundreds of Egyptians have been sentenced to death for their role in the killing of a policeman. It is the largest mass death sentence anywhere in the world, in recent years. A total of 1,200 people were collectively charged with murder following rioting in August. 529 defendants were sentenced to death on Monday. The trial of a further 682 people was adjourned lately. A statement by Human Rights Watch said: “It’s shocking even amid Egypt’s deep political repression that a court has sentenced people to death without giving them any meaningful opportunity to defend themselves.”Egypt has come under increased pressure for its record on human rights in recent months – accused of a violent crackdown on political dissent. There is no doubt that the election has divided the society and will not bring any fruit in the country’s economy. The suppression and oppression on the opposition voices will increase in the near future.